A page with all the current 2014 news about the "BSA Otter" web site and activities. Lets make 2014 the best year ever for the BSA Otter mark. We have proved over the last few years that there is more than a bit of interest for this design of bike, and there basic simplicity makes them an easy build, even for the person with little engineering knowledge. Clearance around the back wheel area is so important, and laking on many Classic British Bikes. But the "Otter" frame design takes care of this. Harry Foster made sure the frame he built had plenty of clearance for the Devon mud. This was past on when Faber used Colin Dommett's original "Otter' frame, to take there jig from. The"Otter" frames I have built, all have this same clearance. And looking at my Scott Ellis replica, with Sports Cub swinging arm I can see why. OK, I have a message from "Number One Fan" for you. and a bit of a Gee -Up for me. If 2013 was the year of research and setting out of New Projects, then 2014 must be the year of finishing them!! i will build my Mills Style trials bike, finish the garden path, and make a body for my Vintage trials car.Wow there is a bar to jump. In "OtterLand" the list looks longer. Bantam, Mini Otter,OOTC,Square Tube "Otter"(SQ), and the Ariel Project. Then all those other ideas that you have and are in line to join the "Otter" page. I hope the coming year is good to you,your workshop is buzzing, and all "Otter" readers have fun. Thanks Rich, this is just what I need is someone to push me to the goals I have set out, big hurdle but I need to get it done. I also want to try and organise a "Otter"meet somewhere. Just a thought at the moment, but the power of the site now !!! it would be good to do this to launch the "MiniOtter" range, in Drawing and instructions for a start. and Richard has replied to me saying it would be a good idea to get all the bikes finished that are projects on this site for you guys to see for yourselves. You could then all bring your bikes along for inspection?? Shall we go ahead with this Idea?? OK New page up, on Gary Britton's superb Faber Mk 3 build. Just look at the bracketry work good ahy. OK Updated the Blue,C15T trials page . OK Update on Dave Wood's Mk 3 Faber "Otter" BSA. page. Thanks Dave. Also Ian Ballard page update waiting for more information on the BSA C15 build Ian?? You must have seen the new page up? After all of the brilliant pictures that Deryk Wylde is putting onto TC at the moment I thought I better delve into my archives, and realised that it was fifty year's since my last Cub trials bike. New Page up on Deryk ?? and I need a response OK. The Bantam frame is at last back from the powder coaters! I have spent time has you do when you get finished items that have been powder coated back! Cleaning threads, and holes etc, and the better the finished job the longer it takes to removetho covering of parts that have been covered with polyester. All major surfaces are covered with aluminium tape and this also takes time to remove. The Rear hub had the same treatment and the holes for the sprocket tapped out with a 7/32"BSCY tap,available from RDG Tools. All engine parts are in place to rebuild the two engines, now I have made the main-shaft nuts myself? I just could not find any to buy. I have had new pictures of owners machines sent to me, and have several new pages about the build of these bikes, in the pipeline. One worrying tale is that I have a bike being built, and I have been promised information about the build but will have, to keep the details to my self ,as the owner is worried about the security of his bikes. unless I can find a way to relate the story to you, without giving any clues to who the person building the bike is. Well after Bob's bike getting stolen last year the owner of the bike to be built is worried about its security. And I don't blame him, I told him my bikes are like children to me and I could not bear loosing one. New pictures on the Bantam page! I have made a crankshaft puller ,for pulling in the shaft to main bearings ,so now the build of these two engines can begin. I have been asked how to convert a early distributor engine to "F'" spec. So I will do a page on this, showing the pit-falls OK. "Page now ON." Just started updating a few of the pages. And may have another fresh page up this week end. Has you can see I have updated some of the pages and put on a New one. I now have to get the three engines in build done and will take pictures has I progress. Just need to put a few more hours in now that the nights are drawing out. Another build is on the cards? But I just need to get some of the others finished first. And More. New Pages this week, and information about New frames ?? I hope. "e-Offroad Reference Library" So take a look at the Deryk Wylde page for details. OK I have been bashing on with the web site this week while waiting for deliveries of precious BSA spares, and parts to try and finish another bike? the SQ framed "Otter"
I have now decided to build up the "Dizzy" motor for this build now I have done the page on the conversion. I have some experimental Triumph T140 forks to put onto the bike too. Alex asked me if I knew where he could get a BSA C15 timing-side bearing conversion? So I emailed Alpha bearings, and Max tells me that a new batch is in manufacture and are available from them. Details on the "ASK ME" page. Just updated the "Two Engine Build" page. it has now become a four engine build too. He tells me he has spent considerable time building a new jig for the Mk 3 frames, and is now building them in batches of ten, when he has the orders for this amount, on a first come first served basis, you only pay for the frames when they are ready for delivery. Take a look at the updated Faber page. Just thought you would like this. I hope you enjoyed this little video, Wow that was a good show. I would like to do it again with the support from you guy's Perhaps the "BSA Otter Classic Trials Show". Yea. 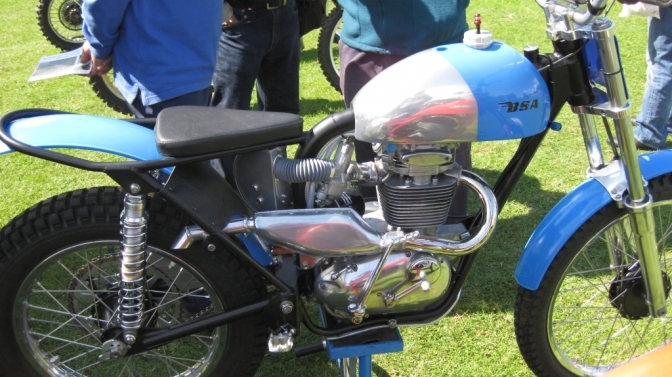 We now have a Forum site for "BSA OTTER" where you can ask questions , and if I can-not give you a professional answer , I will get a expert in that field of the Classic Trials Sport, to answer it for you. We could also just have a Chat. Another page will be released shortly, Named "Dizzy-Bee W,H,Y." On this page for a small fee, you can exchange or buy parts that you need for your precious Classic bike build. Another New page will give details about the location in the UK of Paid Motorcycle Trials Practise Sites. this should help with you getting out to ride your trials bike without the fear of being prosecuted for trespass, and to keep the name of trials bike riders clean. Nice Video of Stu Practicing on the MK1 Otter page. BSA OTTER is moving forward Guy's. OK. I will start local "Classic" trials reports when I have the team in place, and take pictures on the day. I feel this is a turning point in the nature of Classic Trials at the moment? and we want to be on the band wagon when it happens don't we? Just a quick chat about using the Forum Page. I have been told that that people would use it, for sensible discussion on anything about the Classic Trials Bike Scene. But and it is a big BUT. they are worried that this site will carry on from the other Trials Forum sites, And be invaded by the chaff, that so often spoils any sensible discussion. Well I can assure YOU that I will not suffer this on BSA Otter. and will get it moderated immediately. The site is not for whining , it is to promote the future of Classic Motorcycle Trials. OK. I have had emails and phone calls, to say that you Guy's can't log into the forum site. It must be only a glitch, and I am sure the guy's from Freeola will fix it for us. Don't give up trying will you. It is like anything new you do have problems with it? Take the "Super Cub Trials Mini Otter" for instance. It is built up. but I now find that the loop on the back sub frame is to low for clearance. So I have to strip the little bike back down to rectify the fault. All in a days work ? or play!!! though. Take a look at the IOM Otter page. We will review the "Twinshock Scene" on this page with tests of bikes and articles on updates without the expense ETC. Take a look at the MAN-IC Cub Page you may wel see a STAR****** of the future. "SQ" build at last hey Rich!! To Andy Paxton For his Brilliant performance again in the Scottish Two Day Trial. 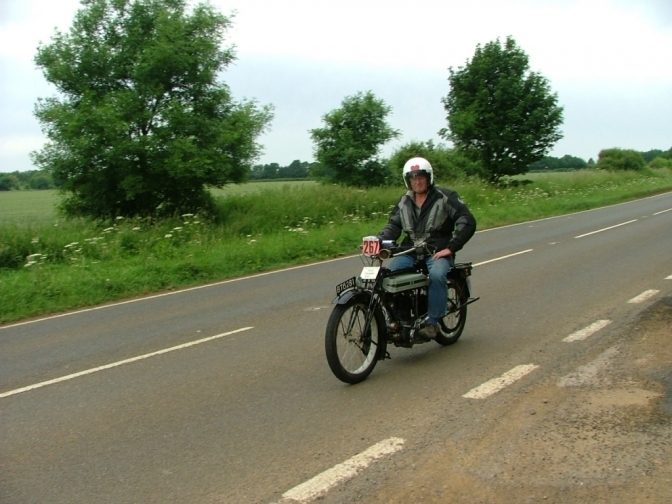 Andy riding his BSA C15/B40. Finished seventh overhaul. getting a Special first Class award. 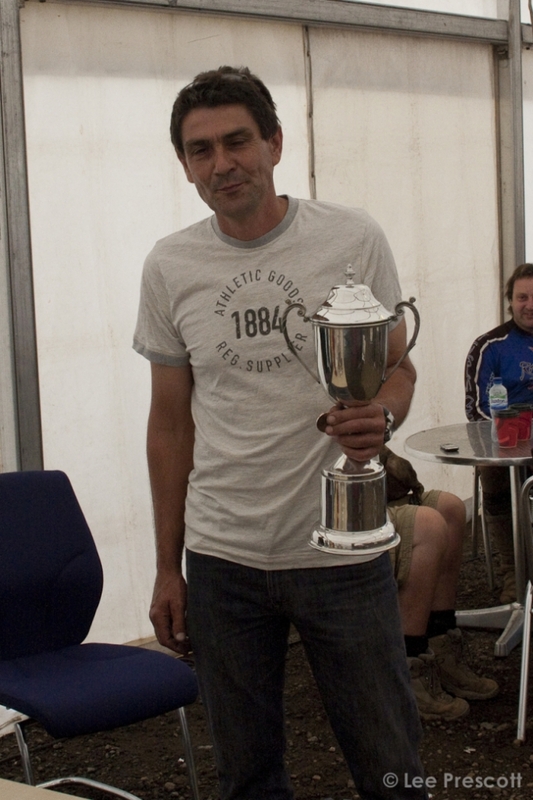 But the best bit is, that he won the "John Draper Trophy "for best 251-350 machine. This is what you call keeping it Local. Congratulations also to Rob Boyer for wining the trial on his Triumph Twin. After the weekend I have spent with eldest son "Lee" and his vision of the cycling ,motorcycling future in his eyes , I thought I better link you with this boy, so here is his web site. There is a lot more to come next week. And he will be the one taking over bsaotter eventually so I hope he comes up with the goods. I now have another "Young Gun" that is interested not only in this web site but in all things "Two Wheeled" Justyn Norek Jr. and his father Justyn Norek famous for his Classic Trials and Scrambles photographs, and also with his design for Cars and bikes. but more of that later. Just thanks guys for what you have sent me .When I get all the information aNd the enormous amount of photos you have sent me on to New Pages on the site, it should really up the anti. OK, Chris ,told you I would get the "Super Cub Trials Mini Otter" running this week? Well it does check out the "Mini Otter Page". I Do like this little bike Very Very much ,I am sure that copies of this little bike will be an owners dream!!! I do so like this little bike, It is a dream, and if any of you want to get involved with this "Dream"
You only have to give me a shout OK, Anyway Enjoy. I will come off of the wall tomorrow. And I must thank Deryk Wylde for the Fire engine shot, "Do You Like That". And Also "The Twig" for riding the bike for me, tried for the White version but he was not available. He wanted to wear his Black helmet, but we would not have seen the broad grin on his face then would we!! Anyway we are in the "PHaze Two" development stage now, and we will see what happens. I already have feelers out for someone to make the frames, and if this happens the rest will just fitinto place. Has you can see we have another couple of new pages up that are strangely linked, along with the one I am currently working on. I must thank Andrew for putting up with me making his page, Thanks fella we are very proud of what you have achieved so far. And another bike that is being built at the moment is also linked. That story will be up by the end of the month if the owner builder makes a big effort to get the bike built???? No names yet. OK you can see what happens with your works BSA Otter Trials rider when the TT comes around. He goes off practicing his road racing skills instead of his trials riding. and just needs encouragement to get out of bed in the morning to become a Star. Nice one Stu, Smooooth too. it must be getting home. then. Go-Pro Hero3+ is also a Star. PS , Last night of closed roads the fella put in a better time for the same run. Because of computer problems,I have got behind with the pages , I was told Apple where the best? but I have a few issues. as I was told you liked it!!! OK, With the week I have had with this computer ??? Throwing every thing out of line!!! I thought we needed a bit of a break? So here is a couple of photos from the "Otterman Archive"
The first is just a photo to enjoy !! by "Lee Prescott". And the second by the same photographer ,of a personalty, for you to Identify from the Classic Trials Scene. I will give you a clue? he was a stand in trials passenger from the sixties? that's all now? Let me know who it is, and the first gets a prize, that will be something to do with Deryk Wylde? And Now this is the one you should be looking at. .OK although there were some answers very close we DID NOT have a Winner. There has been one or two close. I am thinking of doing a weekly puzzle page if you want one? I will try and get some prizes from a few of the guy's in the trade? Anyway, I am back working on the Bantam Project this week, So that "Will" can catch up with his build too. It has not been smooth though? has you can see on the page! Just had an update from Ian Ballard about his bikes , take a look at the page. Go ride the B40 on Sunday Ian and send us a report. OK the Deryk Wylde ORRe version is now up and running ! you need to log onto Trials Central and follow the link from the news feed at the top of the page. I have set up a competition on Deryk's Page, if you would like to Win a subscription to this e-Magazine. OK I have started on the Make-Over of the BSA C15T Frame, Why ? Well I have rebuilt the engine and it seemed sensible, to rebuild this bike so that it is Scottish Two Day compliant. Well Stuart or Brian would like to ride in this trial if they can get an entry. And there is No way that I am going to spend a fortune building a bike for this one trial. So the only thing that is not in keeping with their rules at present, was the lack of engine under-run tubes that Bryan Hyatt had removed. Well you know how much I love this little bike , so I thought I would update it while I still have a chance. Follow the Story on the "C15T Trials test page". Has you can see we have another new page up. showing the superb photo's that Lee takes, when he has the time. I did love the "Colmore Revisitation" Day, we should have more events like that. Enjoy there are loads more photos of that event and the "Classic Trials Show" if you want them? Look I just need to get over today, the New page "Len Hutty" was in the pipe line but was not intended Today. so in the words of Deryk "Bear-with". We do wish Len all the best of luck though don't we. Peter has been through a similar situation and look's like he has beat his enemy ,so we hope Len can do the same. More pages like the Reader page has been updated and there is so much more to come. We Have lost one of my childhood hero's this week Dave Bickers and I must add condolences to his family. There has been some petty squabbles in the "Twinshock World," as well which I will update you later. But Hey, Guy's, is this really worth loosing energy over ?? lets Just Get, or keep a Life. Just updated the "Cotswold BSA" page , As Ken Wallington has transformed his bike in the last few weeks, Take a Look. Other pages have been added too, and Nearly finished research and development of several New ones. that there service is good and it is my router that is the problem. Funny that when I looked into buying a BT package , the MBPS went up. I am sick and tiered at this problem with broadband, I take it that no one is making any money out of it??? I just cant put on line the New pages I have and even the updates .It just takes far to long to load the pictures ETC. and I have got some brilliant one's . With a forced four weeks without Broadband, It was impossible to update any pages or place onto the site the long list of New pages. I see that Freeola now has anew format so I will have to learn to drive this as well. I will start with a new Page featuring the Frenchmen I met at the Manx Classic Trial. Looks like I may have the Broadband sorted for the time being. Hope so. I have been sent some more material from the Justyn's. So another page is imminent. I also have a good amount of information and pictures about the Finland Classic trials scene. So that page will be up shortly. One on the late Chris Leighfield is also in the pipeline along with the long awaited Draper family page. And many more, along with the updates on the engine and bike builds. I know I shouldn't but I am probably about to start another "Otter" frame for an engine that was firstly earmarked for a build, and the used in another bike??? The originator of the British bike trials series, later to become the Sammy Miller trials series. Deryk Wylde. Is about to publish the Full story of this series on the superb Off Road Review “E” magazine. Like me he would like a revival in the series next year with some of the more original British bikes being brought back out of the sheds. We know a lot of the original riders of these machines are getting long in the tooth. But there is NO reason why a younger generation could not be out on these bikes and enjoy fighting an old Classic British bike around the series. I am sure if at least half the entry of bikes were in this category the sections would get set out accordingly. The “Bigger” bike does very well in this series even now. A good example is the Paxton Brothers both riding Swan necked framed BSA B40’s. I for one will be sponsoring son Lee on one of the B40 “Otters” next year. And I hope more of you will do the same. Now is the time to revive interest, this well put together Series. Anyway Rant over, Just take a look at the story on ORRe and this may help your decide. "Don't forget I am telling the story of the Sammy series over several issues of the digital magazine, ORRe, available ONLY from the www.trialscentral.com website. Unlike most other publications, ORRe concentrates on extended pictorial coverage with photographs primarily of the also-rans, simply because they make up the bulk of every event and without them there would be no competition, and, what is more there are always plenty of pictures of the star riders everywhere else. If you subscribe to the magazine which costs a maximum of £12 a year, and that covers at least twenty issues, you can have copies of any of the photographs totally free of charge.........you tell me where you can find better value than that? ORRe-issue7 goes live this weekend - and if you subscribe you automatically get every issue including the back issues included - value for money or not?" The Super Cub Mini "Otter" is now nearly finished, more pictures on the Mini page. A new page for those projects that get started and then are abandoned. Bring them back out . I know of at least one Foster "Otter" that has been sat on a dusty bench for years. all I can say is "Get it Done"
I am probably more guilty than most. But I always did take on to much, and just like starting projects. I need to build another "Otter" frame so that I can update the Frame Building page. I was asked by Dan Williams about frame modifications to a Triumph Cub frame. So have hauled a dusty forgotten project from the Back-Of-The-Shed. for information for Dan and to start the page off. It will be on later today. OK the good news this week is that Howard from Faber Frames has contacted me to say that he is on with a new batch of "Otter" frames,probably MK3's. Look I don't no how many he is making yet. I will ring him in the morning, and try and find out more information. I know he has had trouble sourcing the right tube for the frames,and this has made the wait longer. I have had some brilliant photos of Mk 3 Faber builds sent to me recently. and they are good and you can see the time spent on these builds. The bad news is ,for security reasons I cant put some of the pictures on to the site. But you know that a MK3 bike was stolen last year. and this has worried other owners. Do look after your bikes, you know you would be devastated if yours went too. Well I now have an engine for the SQ framed "Otter". So this will speed up the build of this bike. I already have a pair of "Four-Stud" forks built up from new parts and fitted. So you can follow the build on the page. I will get back to the weekly reports this week now that I have nearly finished the room I have been decorating and fitting new windows. "Its a Time thing". And may have "Time" to place on the promised New Pages. Just spoken to Howard at Faber frames,for you. and he tells me that he is currently building the batch of ten frames now he has the problem with the tubing solved. So if you are on the current list for these ten frames, you can start collecting the parts for your build. Howard says that the next batch wont be started to at least March of next year. and there is already people lined up for some of these. So If you want one get your names down Quickly. This just proves that you guy's out there love the simplicity of the "Otter" frame design. And more than that enjoy building a British four-stroke engined bike, for the site and the sound. Just one image of resent Mk 3 Faber framed bikes I have taken or been sent of resent builds. Just had news back from the IOM. 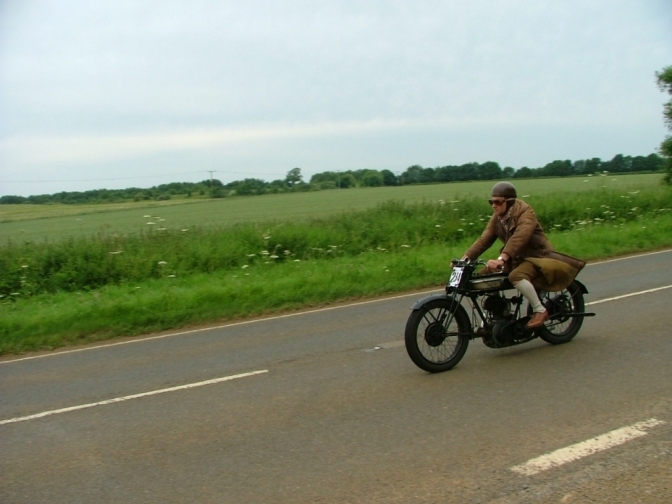 Brian rode the Test Bantam for the first time this year, in the Vintage trial there. Clutch problems forced him out, of the trial. Just proves that when you start tuning a motor you are going to cause other problems. 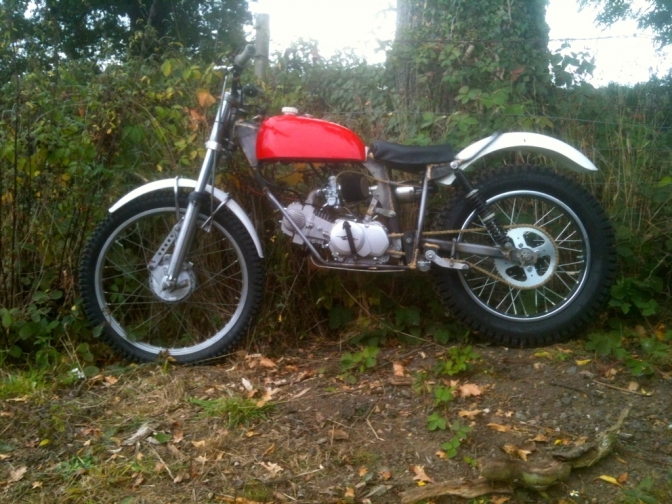 BSA Bantam Build page updated. Today I have found out that after a long fight with illness Sadly Len Hutty Jr has past away. My condolences go to his family at this time, I know how hard it is. But I will always remember Len has the True Gentleman that he always was and a True trials Star, in the Classic sense. RIP mate. Lens page will be updated Shortly. I have today started to write the weekly Classic Trials Bike Scene Page. again and it is now moved up to just below this page. I do need some feedback to this page if it is to make any scene writing it, OK.
OK, Today has been one of them dark foggy days before Christmas in the UK a day that never gets light. But there again it has been quite a "Foggy" day in Australia not so dark but with it's challenges? We must keep a watch on the fog over there for the next few weeks and see if it lifts our spirits over here. Good Luck mate. Any way now I have my internet back again after a day down but not under. I have updated the SQ page, so much more would have been done on this site today, if it had not been for the gremlins that took me off line. Top marks with five lost. Still waiting for conformation on the Saturday, not quick on the web site involved. Bt this means that Andy has won His class championship in the SMC this year. Also Jon Bliss has won his class on his Super Cub Trials at the age of 71, well done Jon. and one up for the Super Cub Trials Machines. Lets just hope that there is a Specials Class next year for these machines in more than One British Championship Twinshock included. I have managed to get contact this week from Pat Slinn after a while. And Pat is going to send me stuff to go with what I already have to be able to do a page on his working life and Machines. I have also been able to get more information for the pages on the Drapers, Chris Leighfield. And also intend to do a page on Sprite trials bikes. I have also been asked how I made my conversion for the Dizzy engined timing side needle bearing, So I said I will do a update to that page with pictures. I intend to get at least SIX new pages on before Christmas so that you have something to read. And the do more pages during the holiday while I am at home this year. We have an outing on the bikes booked for Boxing-day so that will be something else with the "Mini "Otter" Super Cub Trials out for a blast. Firstly I have updated the DIY Frame Build page, and will continue to do so will I am constructing the "Otter"Mk2 frame in build. This should help you to understand the build better and hopefully inspire you to start your own "Otter" frame build. I have also been doing my home work, on the Six pages I intend to publish in the next couple of weeks. Well done "Foggy" you have probably done more for Competition Motorcycling , making it known to the general public ,more than most in the last few year's, and a true gentleman too. I have today received some of the materiel I have been waiting for from Pat Slinn so that I can complete the first page of his working life, this page at the BSA. Also I have received an update from Gary Britton, on his current bike builds so I will also give Gary a Second page for this story. You can see that there are a couple of New Pages up , and I have updated the Dave Wood page and the SQ build page along with some of the others. There are more new pages in the next couple of days has promised.